Apparently an African dish, but who cares where it's from when it tastes this good? 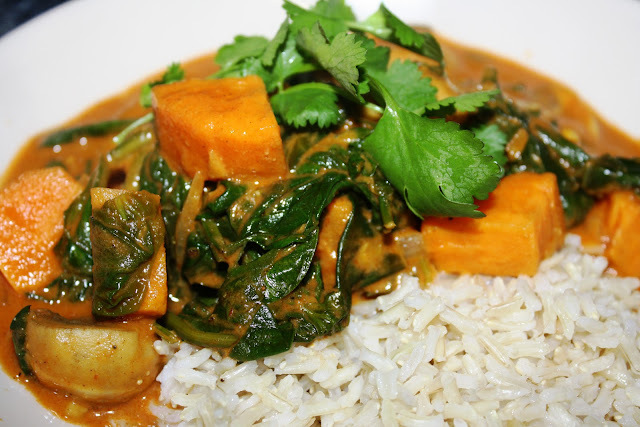 This is really simple to make but quite different from your average stew, and, you'll be stronger than Popeye by the end of it, what with all that spinach. Peel and cut the onion in half, then into thin slices. Fry in a little oil in a deep saucepan with the chopped garlic, grated ginger root and cayenne pepper until soft. Peel the sweet potato and cut into cubes. Not too big, not too small. Add your curry paste - if making your own, mix the spices together with a little soya milk/water until they form a paste - and cook for a couple of minutes to release the flavours before adding the sweet potato. Fry the lot for 5 minutes before adding the tomato passata and vegetable stock. At this point, the stew looks quite watery, but do not fret, it will thicken up when we add the rest of the ingredients later. Bring to the boil, cover and simmer for 15-20 minutes, until your sweet potato cubes are tender. While you are simmering your stew, take the button mushrooms and fry in some olive oil in a separate frying pan until browned. If you can't get button mushrooms, just cut some normal mushrooms in half instead - works just as nicely. Add the mushrooms, roughly shred the spinach (just tear it up with your hands) and pop that in too. At this point I use a lid on the saucepan to help the spinach sweat down and disappear. I know it looks like a lot of spinach when you first put it in, but I promise, it will just disappear into nothing. Keep covering it with the liquid and let it steam a bit under the lid. In a separate bowl or mug, put your spoonfuls of peanut butter. Take a few spoonfuls of liquid from the stew and mix it in to soften the peanut butter nicely so it will pour into the stew rather than clump up. Pour it in then, pour it in. Right before serving, season the stew as you like it and add the chopped coriander. Stir it all up together well and make sure it's piping hot before you spoon it out. I usually just serve this on a bed of rice - brown being best of course, love that nutty texture - but do as you please with it. Just make sure your favourite person round the dinner table has the BIGGEST portion. Done.